John Cage is well known as the composer who formalized the use of silence as a compositional element on par with any other note or sound. He was also the composer who, though Zen Buddhism, introduced chance into composition, allowing the I Ching to dictate the terms and conditions of sound heard in a way that no egomaniacal romantic would have ever allowed. Cage was content to determine the methods of composition without micromanaging the process note-by-note. There are many good books on Cage’s work, including Michael Nyman’s Experimental Music: Cage and Beyond and Kyle Gann’s No Such Thing as Silence. But unlike many other composers, Cage is quite capable of explaining himself and his methods. He is immanently quotable. “And what is the purpose of writing music? One is, of course, not dealing with purposes but dealing with sounds or the answer must take the form of a paradox: a purposeful purposelessness or a purposeless play. This play, however, is an affirmation of life– not an attempt to bring order out of chaos nor to suggest improvements in creation, but simply a way of waking up to the very life we’re living…” (Cage, Experimental Music, 1957). This program borrows a couple of techniques from Cage. 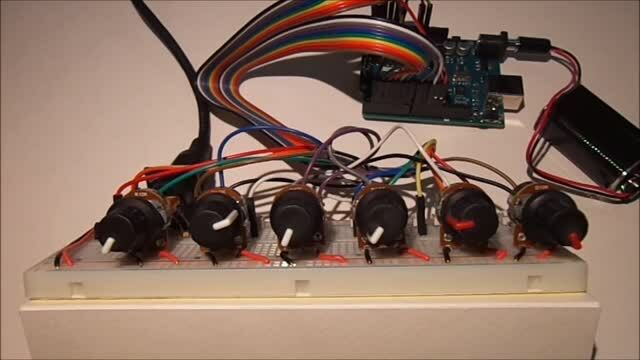 This implementation of the standard breadboard circuit documented here uses the random number generator within the Arduino to determine which instruments and which pitches will be used for four notes. Instead of being able to manipulate the materials composers usually control, in this case, the composer or performer can only control the amount of silence. The four potentiometers to the left on the breadboard control the amount of silence between the four random sounds. The fifth potentiometer controls the length of time they sound and the sixth controls the overall volume. The video below demonstrates the circuit in action (or the lack thereof). This is a very quiet video, asking you, as Cage would, to listen carefully. Video and code below. of all notes to 0 for any length of time. functions are defined at the bottom of the program. // Create variables to use throughout the program. //  of notes, velocities, and instruments. //  in effect generate a new random selection. CTRL_CHANGE 0xB0 indicates control change on Channel 1. PROGRAM_CHANGE 0xC0 requests a program change on Channel 1. This entry was posted in Experimental Music, John Cage, Uncategorized. Bookmark the permalink.